Tasso is your cast iron specialist with more than 50 years of expertise in continuous cast iron bars in various dimensions. 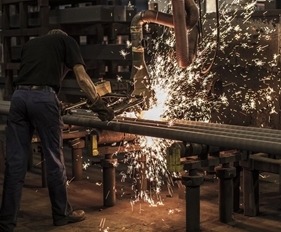 We support our customers from choice of product to delivery and our facilities cover casting, heat treatment and pre-machining of continuous cast iron bars. We also offer logistics service and warehouse storage. Tasso is an internationally orientated business with a significant export share. With an annual capacity of 18,000 tons, we are one of the significant manufacturers of continuous cast iron bars in Europe and cooperate with wholesalers across Europe. We work closely with our customers to create value in your business by supplying high quality products and service that meet your requirements. We are easy to deal with and our team work with dedication and flexibility to service you. Tasso is part of the Vald. Birn Group.